When you drive down a nice street in Oakville, your eye is probably drawn to the house with professional outdoor lighting that not only highlights the home, but the landscaping as well. Wouldn’t it be awesome if your home looked that amazing at night! It always feels great to have friends and company comment on how your house looks, even if they visit at night. Creating dramatic curb appeal isn’t as hard as you think! In fact, your daytime curb appeal might be just fine, but no one can see it at night! Don’t settle for just safety or security with your outdoor lighting, create an effect you love, that’s welcoming, and gets noticed for all the right reasons. We’ve put together a short list of our best tips on how outdoor lighting can improve curb appeal below. Most homeowners put a lot of time and effort into the curb appeal of their home. They work on gardens, lawncare, porch decorations—but all that effort goes unnoticed at night. Professionally designed outdoor lighting will accentuate your home’s architecture and landscaping as well as improve security and safety. Gables, symmetrical pillars, stone facades, don’t lose any of those fabulous features because the sun went down!Good landscape lighting design is understated and subtle (the opposite of flood lighting) but still points all the attention to the features of your homeyou’re most proud of. 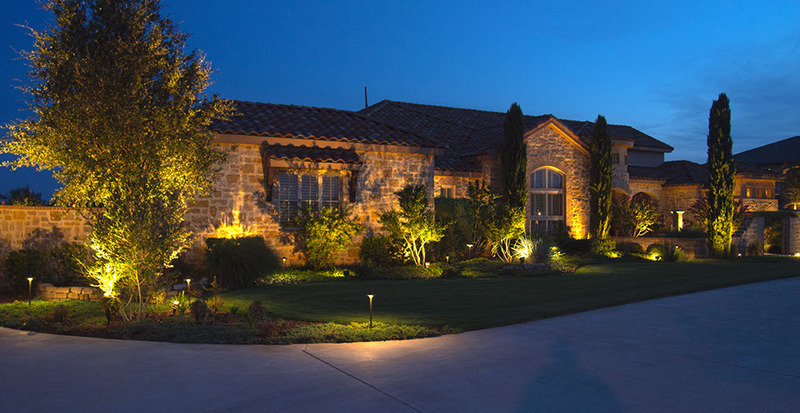 Outdoor lighting ensures your home has its best side turned to the street day or night! Thieves search out darkened lanes and doorways, but effective landscape lighting makes your home less attractive to them because there’s no longer any dark spaces to linger in and neighbours can see clearly what’s going on. A well-lit home or business is far less likely to be targeted by criminals.Burglars and vandals look for the easy targets, entry points they can get to and from without being noticed. Thieves aside, outdoor lighting also helps prevent minor injuries from slips and falls due to unseen walkways or paths, changes in elevations such as on stairs or porches, and guides guests directly to your door in a way that’s warm and welcoming. Look out for family and friends’ safety and have them convinced the outdoor lighting is just there to make things look nice—how clever are you! According to the Associated Landscape Contractors of America, professional landscaping can increase the value of your home by a minimum of 15%. This often equates to the homeowner recouping 100% to 200% of their investment! Imagine the value added by being able to see the landscaping and architectural features that make your home stand out morning, noon, and night all year round! Your front door is the focal point for your home. It needs to be functional, yes, but it can also be stylish and a reflection of your taste and personality. You need more than a fancy wreath on the door to make it a focal point! Don’t skip adding the perfect lighting to your front door or porch. You need to ensure there is adequate lighting simply to ensure you can see to get the key in the door or punch in the code after dark, but outdoor lighting draws the eye and can be either stark, ineffective, or WOW your guests and neighbours. Old or dated fixtures don’t put your home’s best foot forward when it comes to curb appeal. For instance, a single door entrance would be served well by a single fixture that functionally illuminates the door and house number, but don’t forget to choose a style that fits the look of the home. For a double-door entry, symmetry is a great effect with matching fixtures on each side to highlight not just the house number but any decorative touches you might add. By updating or adding fixtures, your front door can create visual appeal to make your home pop from the street. Good design is all about balance and many homes have front porches that are too small to create an eye-catching focal point on their own. Add some fantastic outdoor lights and BOOM! Suddenly your neighbours are commenting on how nice your home looks. Consider replacing tiny fixtures with larger pieces to make a great statement. Eye-catching pendant lights are growing in popularity. Post lights can functionally light up stairs and still look amazing. Recessed lighting (lights flush with the surface they’re mounted into) can cast subtle light from under a railing, bench seat, or stair treads.Lighted plant containers and planters are growing trends. They highlight not only the plant in them, but cast ambient light that’s not glaring or harsh—and can be a great conversation piece. There’s so many great ways to effectively light up your porch, you’ll just want to stare at the front of your home! We love our flowers and trees and shrubs, and outdoor lighting can ensure you enjoy them at night too. Whether the fixture is flush with the ground and pointing up through the leaves and branches, placed behind to cast shadows and highlight shapes and movement, or placed among tall branches looking down to mimic moonlight, your landscaping won’t go unnoticed at night any longer.The eye is drawn to the landscaping details without overpowering the other aspects of your outdoor lighting for curb appeal. Remember, a lighthouse makes no noise but everyone notices it. Every home has unique architectural features worth highlighting that add character to your curb appeal. Century homes often have peaks, scroll work, or other unique features. Modern homes have sharp angles and clean lines. Lights looking down from beneath the eaves highlight columns, pillars, and other symmetrical details. We made fun of flood and wash lights earlier, but they have their place in outdoor lighting because they can maximize the perception of height and can make even plain walls looks attractive at night. The best outdoor lighting design often maximizes simplicity to draw the eye to the details of the home and not the light itself. No one wants their front walkway to look like an airport runway. Add some style and class to you outdoor lighting—even lighting meant primarily for safety, by using recess lighting to provide subtle up light. Place lights among the foliage in walkway gardens to cast ambient light that highlights the garden and guides your guests’ feet on the walkway.Post and stake lights come a variety of styles, power needs, and can highlight unique features like stone pathways and ground cover plantings. Add a romantic feel by placing lights in the shrubs and trees along the pathway to cast shadows on the walkway that still provide safety light but create an ethereal effect at the same time. Pathway lighting is really versatile so don’t aim just for utilitarian—reach for a style that makes you smile whenever you’re walking that path or walkway. The easy way to light up a driveway at night is to place lights at evenly spaced intervals down the length of the drive. Ho-hum. Can you hear the drone of airplanes in your ears looking for your runway? *grin* Neighbours walk or drive by and nod – that’s a driveway. Instead, use outdoor lighting on your driveway to draw the eye right up to the house and make them go WOW! Try staggering the lights on alternating sides so that drivers can see clearly but the lighting isn’t overpowering or intrusively bright. Focus lighton places where there are bends or curves in the drive, and highlight close obstacles such as trees, walls, fences, boulders, or a hillside. A lamppost or entry pier at the entrance to your driveway can add curb appeal, provide safety lighting, and also illuminate an address marker. This style of light would require a little extra work (underground wiring), but this means they’ll shine bright no matter the weather or season. Let your personality and the character of your home shine by choosing a fixture that draws the eye. Solar lights are a great option and have come a long way in terms of reliability, holding a charge, and storing power for cloudy days. Solar lights are incorporated into a wide variety of fixtures now, and the stake lights offer interesting versatility if desired. Ask one of our experts about solar lighting because they are not all created equal. We want your home to shine from the street day and night! Why not chat with our expert team at Nite Time Décor Oakville for a professional evaluation of your home and yard. We’ll take care of the details to ensure everything is done right the first time, and then sit back as the compliments from neighbours and guests pour in!